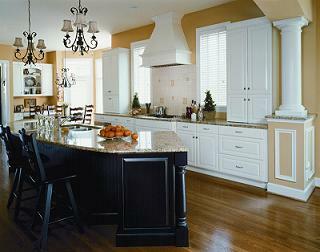 Granite countertops are timeless and genuine embellishments that can add a really classic finish to a kitchen space. A granite countertop can provide your kitchen space with a sophisticated accent that will enhance both value and design. Beyond stunning beauty and marketability, a granite countertop can also have health benefits as it is a stain-proof and hydrophobic surface that can protect you from bacteria, germs and stains. Also, a granite countertop requires little maintenance and has high durability as well. So, if you are looking for the perfect way to improve the way your kitchen space looks and increase the value of your home, you should definitely go for a granite countertop. Abrasive  a non-reflective and flat surface that is mainly used for outdoor installations, acid etched countertops that are provided with an antique look by using acids or abrasives on their surface, brushed finishes that are coarser to the touch when compared to other types of finishes, brush-hammered finishes that are achieved by a special mechanical process, thermal or flamed finished granite roughed by heat, honed finishes that come with little light reflection an sandblast finishes that come with little/no gloss and matt-like textures. Soon after choosing the wanted finish for your granite countertop, you will have to choose its edges. You can choose from more traditional and curved edges, beveled edges, round edges, straight-like edges, bull-nose edging and waterfall edges.